Celebrate the one-year-olds in your life with this perfect first-birthday gift! You're one! You are one of a kind. Great things come in ones. Which ones will we find? 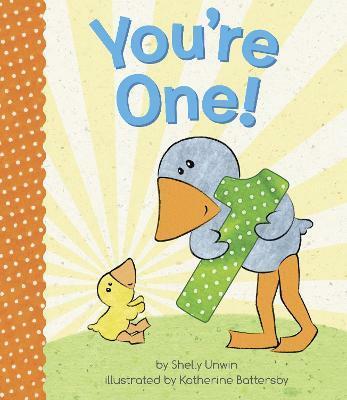 In this lively and fun-filled board book celebrating the number one, babies and their favorite grown-ups will enjoy finding all the ways in which number one is special: one tummy to tickle, one mouth for eating birthday cake, one moon, one sun... and one YOU! Children will love having their special age celebrated in such a personal way, and parents will appreciate the easy introduction to counting and super-simple math as baby gets comfortable with the idea of one as a number. It's a perfect gift for first birthdays and baby's first Christmas--or anytime your little ONE is celebrated! And look for the companion book, You're Two!, for all the two-year-olds in your life! SHELLY UNWIN is a children's book writer and former teacher. Her books include You're One!, You're Two!, and Blast Off! She lives in Australia. Learn more about Shelly's writing at Shellyunwin.com, and follow her on Facebook at @ShellyUnwinAuthorPage. KATHERINE BATTERSBY is the author and illustrator of the Squish Rabbit series, which the New York Times said "is bound to win children's hearts" and which Kirkus gave a starred review, and she created the illustrations for the board books You're One! and You're Two! She regularly speaks in schools and libraries and is a passionate advocate for literacy and the arts. Katherine grew up by the beach in Australia and now lives in Canada with her poet husband and their slightly mad puppy. Learn more about her work at Katherinebattersby.com, and follow her on Facebook at @KatherineBattersbyAuthor.